A multitute of experience await in Moncton! The Moncton neighbourhood truly offers something for everyone! From great golf courses to rich history, water slides to indoor rides, and shopping to hiking – this neighbourhood beckons the whole family. The Moncton neighbourhood stretches from the Petitcodiac River (which separates Albert and Westmorland Counties) through the communities of Dieppe, Memramcook, Dorchester, Sackville, and Aulac to the New Brunswick/Nova Scotia border. The Moncton area is unique in it’s cultural and linguistic diversity; it is a truly bilingual area with the population almost equally divided between French and English language speakers. Moncton is rich in history as an Acadian settlement, originally named “Le Coude” (French for elbow) as a description of the bend in the river on the current Moncton site. The town was empty for several years after the Acadian expulsion until eight families arrived from Pennsylvania to re-establish the community. The new township was named after the British soldier Lt.-Colonel Robert Monckton, who led the capture of nearby Fort Beauséjour in 1755. The town flourished as a shipbuilding centre until the birth of steam and iron ships. The community was revived again as the “Hub of the Maritimes” with the arrival of the Intercolonial Railway in 1871. Today, Moncton is home to approximately 115,000 people. The economy is diversified, including a large call-centre sector, technology sector, industry, and service sector. Moncton combines a rich history and an exciting present to offer visitors a great visit in the future! Splash down at Magic Mountain, where the water games range from the laid-back lazy river to the kamikaze water slide where you plunge (almost) straight down at up to sixty kilometres per hour! Then float on the waves in the wave pool and rest in the hot tub. When you’ve had enough of the water games, wander across the street to Magnetic Hill Zoo, Atlantic Canada’s largest zoological park. This award-winning zoo is home to a wide variety of species ranging from camels, zebras and tigers to a diverse collection of primates and a new Insectarium. A visit to this part of the Moncton would not be complete without testing the magical, Magnetic Hill where a car placed in neutral will drift back ‘up’ the hill! If a rainy day makes outdoor activities less attractive, check out Crystal Palace in Dieppe. It’s an indoor amusement park chock full of rides that will make your day go even faster than the roller coaster! You’ll also want to check out their merry-go-round, bumper cars, eighteen-hole mini golf course, and kiddie train. Crystal Palace offers a Best Western Hotel (in case you want to stay for another day) and a movie theatre – where the seats stay still! Moncton’s City market offers an opportunity to taste some wonderful produce and cooking from the area every Saturday morning. There are also numerous vendors selling crafts, and unique items to take home as souvenirs. On Saturday evenings in the summer, the City hosts “Music at the Market,” outdoor concerts that are fun for the whole family. Did you bring your golf clubs along? If so, the Moncton neighbourhood will definitely soon be a favourite! 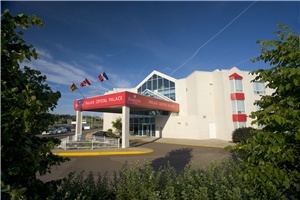 Check out the many courses in the area, including Country Meadows Golf Club, Lakeside Golf Club, Maplewood Golf & Country Club Ltd, Magnetic Hill Golf and Country Club Ltd, Memramcook Valley Golf Club, Moncton Golf and Country Club, Petitcodiac Golf & Country Club, Royal Oaks, Sackville Country Club and Stonehurst Golf Club. You’re sure to find one you like, and many more wait to be tried on your next visit. 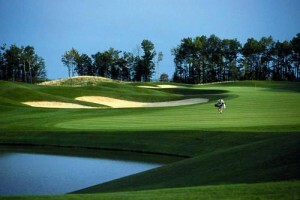 Planning to be in the area when it’s too cold for the water park or the golf course? You may want to join the Moncton Wildcats of the Quebec Major Junior Hockey League to help “Rattle the Cage!” Wildcats games are packed with fun; even the intermissions go quickly since they’re filled with games and contests for the young and young-at-heart. Mascot Wildcat Willy and his friend Furball entertain fans both on and off the ice! But, ff you’re looking for something a little more sedentary, don’t miss the Capitol Theatre. It was built in 1922 and has been restored to the elegance of the day. The Capitol showcases local, national and international talent all year round. The Petitcodiac River plays host to an amazing natural phenomenon: the tidal bore. 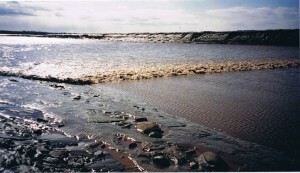 At high tide in the Bay of Fundy, the surging waters cause the water in the placid Petitcodiac River to roll upstream in one wave, that can range in height from 3 cm to 60 cm. The Tidal Bore can be seen from many places in the City, but the favourite is Bore Park on Main Street, where a giant clock tells you when to expect it’s arrival. Nearby Memramcook is home to the Collège Saint-Joseph. Founded by Father Camille Lefebvre in 1864, it was the first French-language degree-granting institution in Atlantic Canada. It became the Memramcook Institute in 1966 and now houses the Learning and Vacation Resort, the National Life/Work Centre and Athene, a virtual learning network. A monument to Father Lefebvre, erected in 1896, stands close by and marks this National Historic Site. Dorchester’s tree-lined streets feature beautiful gardens and majestic houses dating back to the early part of the 19th century. Dorchester hosted Canada’s Fathers of Confederation for afternoon tea parties at Edward Barron Chandler’s sandstone Georgian mansion (now known as Rocklynn). In Dorchester, native Canadians found an abundance of game and, later, shipbuilders, stone masons and stevedores built a living from the area’s abundant natural resources. While you’re here, don’t miss the Keillor House & Coach Museum, an early regency stone mansion built in 1813 by John Keillor, or the St. James Textile Museum, featuring textiles and tools of the trade from the 1800s. The magnificent heritage homes and stately trees of Sackville are not to be missed! The community is home to Mount Allison University, which has consistently ranked as one of Canada’s top post-secondary institutions. Even if you are not interested in studying at “Mount A,” the grounds are a beautiful place to wander about – from the swans and goldfish at the pond to the Owens Art Gallery. The Sackville Waterfowl Park is a great spot for those interested in birds – from novice to expert! The boardwalks allow you to get out among the water birds without getting your feet wet! You can expect to see Red-Winged Blackbirds, Mallards, Pied-Billed Grebes, and many others on your visit. Just short of the Nova Scotia border, the community of Aulac offers a chance to get a relaxing bite to eat within site of the Tantramar Marsh. A stop at Fort Beauséjour – one of the few Canadian fortifications where fighting actually occurred – is a must. Constructed in 1751, Fort Beauséjour was built in response to the British establishment of Fort Lawrence, just across the Missiquash River – the dividing line between British-held Nova Scotia and Acadia. The British, under Lt. Col. Robert Monckton, captured Fort Beauséjour in 1755 and used it during the expulsion of the Acadians. There’s much to be seen and experienced in the Moncton neighbourhood! Don’t miss the opportunity to sample authentic Acadian cuisine, visit historic sites, and take in some of the rides at it’s modern parks… this neighbourhood truly does offer an unforgettable experience for everyone who visits!